Sidenote: I’m taking a short break from the horror franchises reviews to review This is the End. Don’t worry, after this review I fully intend to return to the Friday the 13th reviews. For now, enjoy! Movies really should use the concept of adlibbing more often. I’ve personally seen a few movies and TV shows that have done this, and usually it has a different feel, and usually it’s in a good way as well. There was one movie that I have been waiting months to see for a lot of different reasons, and its use of adlibbing is only one of them. The movie in question is This is the End, yet another R-rated comedy on the end of days. Where does it rank among the others? It’s hard to say, but one could easily say it ranks in one of the undoubtedly funniest films of that topic. Jay Baruchel’s flight has just landed in Los Angeles, and he’s there to see his oldest friend, Seth Rogen. The two of them head back to Rogen’s house where they end up smoking pot, playing video games, and watching 3D TV. Seth decides that they should head out to James Franco’s house, because he’s holding a huge party with the most well-known celebs. Jay is a bit apprehensive, but tags along anyway, because Seth is his friend. While at the party, the apocalypse hits them. People start getting sucked into the sky, sink holes show up, everything starts burning, and well…the end is near. 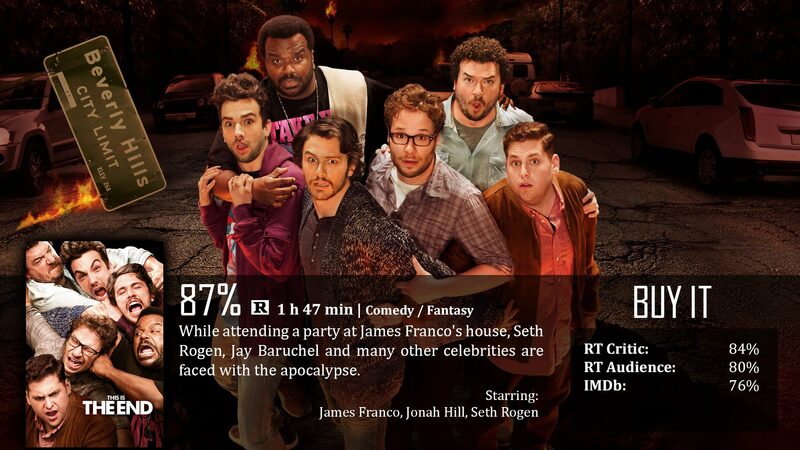 So Jay, Seth, James, Jonah Hill, Danny McBride, and Craig Robinson hide out in the house awaiting to be saved. Though…that might be out of the picture, they must find another way to save themselves in order to live. This is one of the most random movies I have ever seen, but unlike other random films, this one is done really intelligently and well. These actors are amazing at adlibbing their work and using each other as templates for their jokes. I’m not kidding, these guys have great chemistry and some of their jokes are the funniest jokes I’ve heard all year from any comedy. Some of the best jokes were indeed shown on the trailers, but there was still plenty of humor left to laugh practically the whole way through. Some of the best humor was near the beginning with practically every modern comedic actor known to man. I don’t know how they supplied a paycheck to everyone, because it was impressive. I only wish the whole cast of famous people could have stuck around longer. If I had one warning to tell people before watching this: this is an R-rated comedy. Do not expect anything else. The filmmakers’ goals in this film were to get the actors to do the unthinkable until they reached their limit. They kept having these actors do the unthinkable until they physically said, “no, I won’t do that.” That should tell you something before deciding to watch this film. Don’t watch it if you’re not okay with the fact that you’re an adult. Go watch Charlie Brown if that’s the case. I won’t get into how the movie ties everything up for the end. What I will say is that you will be happy with it. Why? Because it makes no sense while making perfect sense at the same time…just like the rest of the movie. All I can really say is that this movie is very different than your typical R-rated comedy or even R-Rated comedy on the end of days. It fits into its own category, a hilarious category that never quits. This is the End had surprisingly great performances by Rogen, Baruchel, Hill, Franco, Robinson and McBride. Their nonstop random humor and the odd category this film falls under worked perfectly together, ending with a satisfactory close. Great review Dave. It’s a movie that wants you to have fun, laugh, and above all, enjoy yourself like the end of the world was actually occurring outside of the movie theater.